I am so lucky to live in a city that has great evening classes. 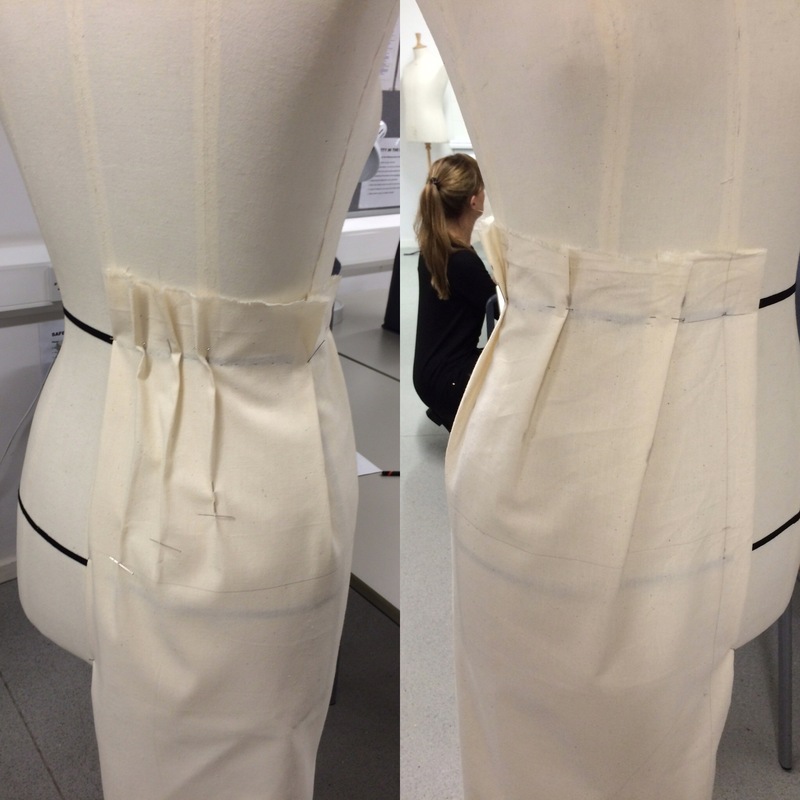 Last term I started to learn draping at Morley College. My teacher is New Yorker Lynda Kinne. 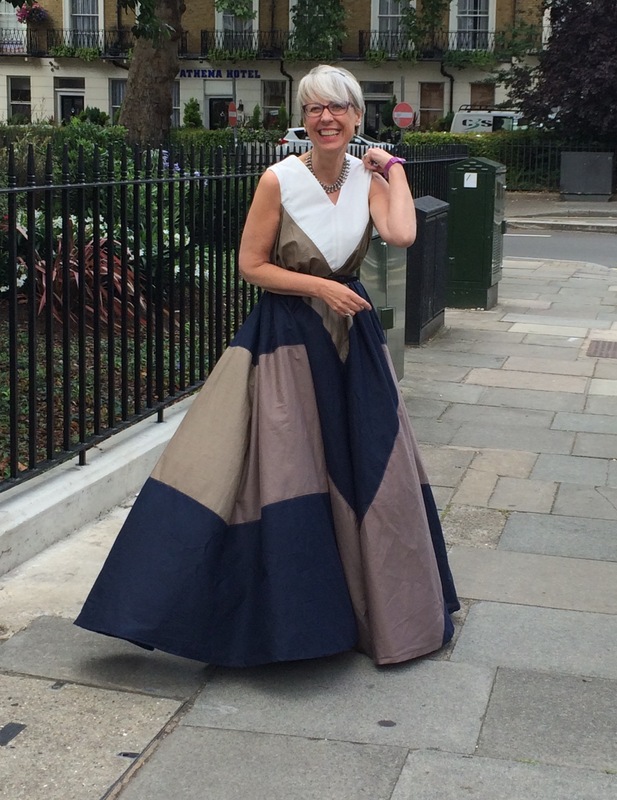 Last term we focused on dresses, which culminated, for me, in the creation of my amazing circle dress. This term we are draping skirts, which is actually easier than a dress as we are only trying to fit the waist and hips (rather than the bust and shoulders as well). Our first project was to drape a straight skirt with a side seam, front and back darts. Lynda was kind enough to let me do something a little bit more challenging. I decided to drape a skirt with no side seam, made from one straight piece of cloth. Once the straight grain is lined up at CF and CB I was able to put three small darts in the back. 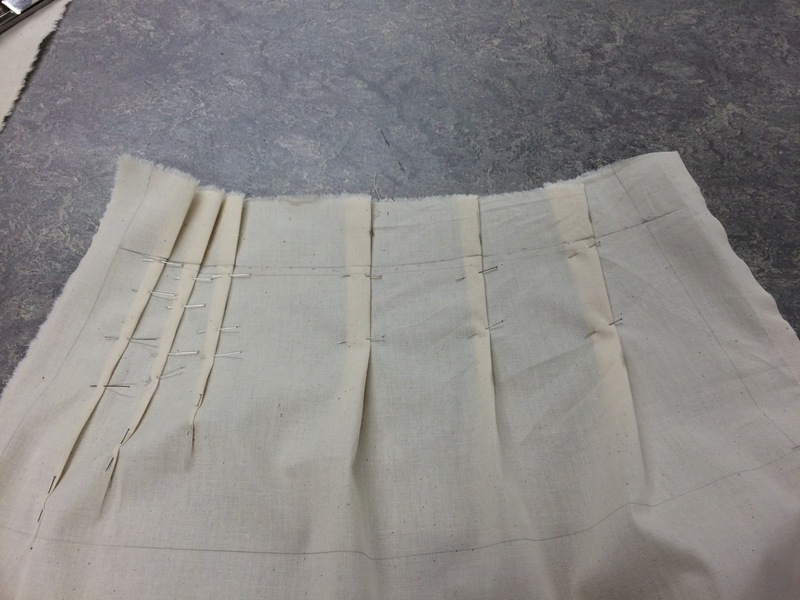 I then created three more substantial pleats at the front to suppress the rest of the fullness. I thought the skirt had an Edwardian feel, and considered making this up as a long skirt. A film about the Suffragettes is just being released in the UK, so I think this look may catch on. The pattern, flattened out, shows how neat this design is. It is just one rectangle of fabric that only needs the darts and pleats stitching down, a CB zip and a waistband. I will try to make up a “wearable toile” of this skirt before the class next week, when I have to come back with some ideas for more skirts. Have you ever made a modelled skirt? If not, have you got a design you would love to make? Any ideas or suggestions would be very welcome. The top of the draped skirt could be made into a curved yoke with a section attached below it for more flare. Once the circumference is perfect, you can go crazy! Love your posts…keeps the rest of us on our toes! Looking forward to seeing this made up. If you are aiming for an historic look, would hobble skirts provide inspiration? I’m glad you’re enjoying your draping class. I like the idea of this skirt and am looking forward to seeing your next steps. Later this term in my pattern cutting class, we have to make a garment (not sure what yet) where the seams are not where you would expect them to be. Last year we did some draping and I believe there’s more on the cards for this year. I wasn’t very successful in my attempts. A Japanese pattern book I have includes a long loose skirt with a back gusset that ‘suggests’ a bustle. I like the idea, but not the implementation in that book. Maybe you could try something with that idea? The wrap skirt I recently made has no side seams, and the darts at the side totally work for me. I think when you have no side seams, you have opportunities to do something with the cf or cb seams because one or other of them becomes a design feature, right? How exciting! I’d love to do a course like this, but there’s nothing near me. The only courses in my area I know of are the ones I teach! I’m not that far out of London, but far enough that travel expenses make studying in London too costly. I love your circle dress by the way, it’s amazing! Well it is quite cool that you are teaching. Sometimes I feel my teacher learns as much through teaching as she teaches. Yes, I definitely learn when I teach! I think ‘Suffragette Chic’ will be a style wave for sure! Since I am such a visual learner I would love to see a toile that includes the zipper. I’m often drafting extra pleats and darts into garments since I feel they flatter and add interest. What fun. 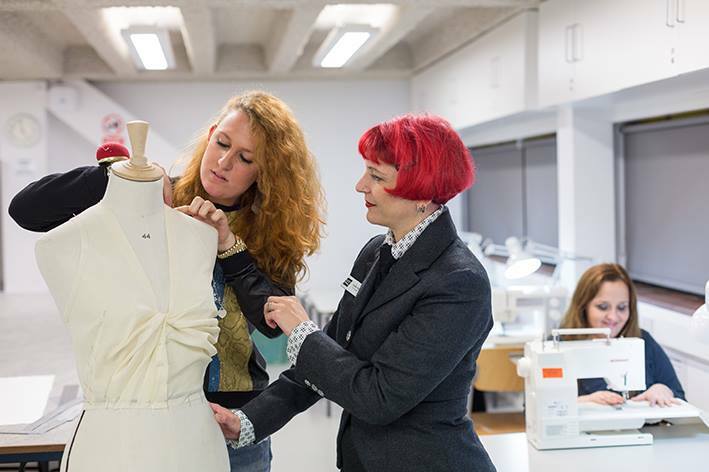 Draping encourages you to get creative. I’m looking forward to seeing your projects. Morley College is wonderful. I have managed couple of weekend Pattern Magic courses which I loved. The longer courses like yours sound fabulous but impossible for me. I wish there was an equivalent college in the Birmingham area. Have fun with your skirt.